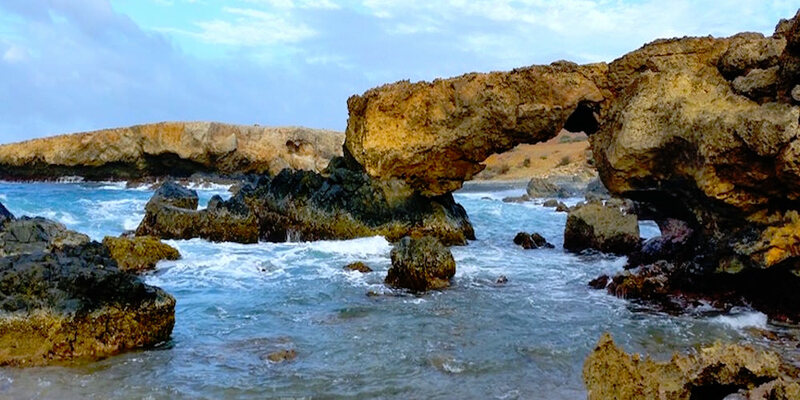 Lined with small and shimmery black eroded stones, Black Stone Beach is the only beach in Aruba boasting “black sand”. Erosion by the water not only created black pebbles but also rather sharp and edgy rocks that both characterize this location. Black Stone Beach lies just east of Boca Andicuri or Andicuri Beach, it is located close to three newly forming natural bridges in Arikok National Park. The beach is quiet and secluded. Swimming or snorkeling here is not recommended, because of the strong currents and high waves at this location. This beach, on the east side of the island, might be an ideal location to enjoy a picnic when you are in the neighborhood. The surroundings are rocky, and you will hardly find soft sand. Black Stone Beach is actually a little bay, where the ocean reaches the beach you will notice scattered rocks everywhere. The beach features some vegetation but when you are looking for trees to enjoy some shade, you will be disappointed. They’re just not around! Black Stone Beach is located at the east, rough side of Aruba, at an off the beaten track location that not a lot of tourists go to. Make sure you arrange proper transportation such as a four-wheel drive. Wear proper clothing and a pair of good shoes. Walking around barefoot is not really an option at this location. Make arrangements for sufficient refreshments and some food and bring towels and protection from the sun like hats or caps and sunglasses. Don’t forget to bring some protective sun lotion too. From Oranjestad, make sure you enter Caya G.F. Betico Croes driving to the east. Follow directions to Hospitaalstraat. At the roundabout, follow directions to Sero Blanco that brings you to road 6. At the next roundabout at Paradera, make a right turn and drive onto road 4. Just before you enter the neighborhood Piedra Plat, make a left and follow directions to Ayo. Continue driving east to Andicuri Beach. Once you have arrived at Andicuri Beach, make a right turn until you reach the first bay on your left side. You have arrived at Black Stone Beach. The trip shouldn’t take longer than about 30 minutes.